Whoever wishes to blame or attack me is entitled to do so. 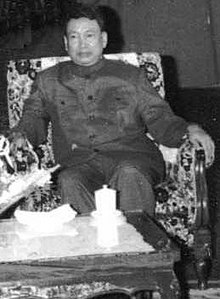 Pol Pot (19 May 1925 – 15 April 1998), born Saloth Sar, was the General Secretary of the Cambodian Communist Party (Khmer Rouge) and the Prime Minister of Democratic Kampuchea from 1976 to 1979. He presided over a totalitarian dictatorship which made urban dwellers move to the countryside to work in collective farms and on forced labour projects. The combined effects of executions, strenuous working conditions, malnutrition and poor medical care caused the deaths of approximately 25 percent of the Cambodian population. Everything I did, I did for my country. We want only peace, to build up our country. World opinion is paying great attention to the threat against Democratic Kampuchea. They are anxious. They fear Kampuchea cannot oppose the Vietnamese. This could hurt the interests of the Southeast Asian countries and all of the world's countries. Our policy was to provide an affluent life for the people. There were mistakes made in carrying it out. Several thousand people may have died. First, I would like to tell you that I came to carry out the struggle, not to kill people. Even now, and you can look at me, am I savage person? My conscience is clear. There's what we did wrong and what we did right. The mistake is that we did some things against the people — by us and also by the enemy — but the other side, as I told you, is that without our struggle there would be no Cambodia right now. 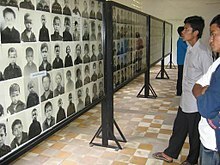 Tuol Sleng was a Vietnamese exhibition; a journalist wrote that. People talk about Tuol Sleng, Tuol Sleng, Toul Sleng, but when we look at the pictures, the pictures are the same. When I first heard about Tuol Sleng, it was on VOA [Voice of America]. I listened twice. We did not yet have laws or order. We were like children just learning to walk. Men, women, children and babies were often brutally clubbed to death with hammers and buried alive. As the architect of a brutal social experiment driven by racial and political hatred Pol Pot's regime left behind a tragic legacy of misery and mass graves. In Cambodia, the Cambodian people, communists and patriots, have risen against the barbarous government of Pol Pot, which was nothing but a group of provocateurs in the service of the imperialist bourgeoisie and of the Chinese revisionists, in particular, which had as its aim to discredit the idea of socialism in the international arena... The anti-popular line of that regime is confirmed, also, by the fact that the Albanian embassy in the Cambodian capital, the embassy of a country which has given the people of Cambodia every possible aid, was kept isolated, indeed, encircled with barbed wire, as if it were in a concentration camp. The other embassies, too, were in a similar situation. The Albanian diplomats have seen with their own eyes that the Cambodian people were treated inhumanly by the clique of Pol Pot and Yeng Sari. Pnom Pen was turned into a deserted city, empty of people, where food was difficult to secure even for the diplomats, where no doctors or even aspirins could be found. We think that the people and patriots of Cambodia waited too long before overthrowing this clique which was completely linked with Beijing and in its service. He said that he knows that many people in the country hate him and think he’s responsible for the killings. He said that he knows many people died. When he said this he nearly broke down and cried. He said he must accept responsibility because the line was too far to the left, and because he didn't keep proper track of what was going on. He said he was like the master in a house he didn’t know what the kids were up to, and that he trusted people too much. Pol Pot makes a very powerful impression on those who hear him for the first time. After that, they want to come back... Those who attend his seminars feel enlightened by his teaching, his explanations and his vision... He's like a father to us. 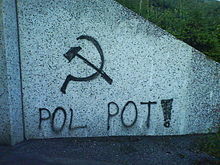 It is good that Pol Pot is dead. I feel no sorrow. Pol Pot was a Vietnamese agent. I have the documents...The world community should stop talking about this now that Pol Pot is dead. It was all Pol Pot. He annihilated many good cadres and destroyed our movement. I hope he suffers after death. He was always a good husband. He tried his best to educate the children not to be traitors. Since I married him in 1985, I never saw him do a bad thing ... What I would like the world to know was that he was a good man, a patriot, a good father. [Pol Pot] sacrificed his entire life … to defend national sovereignty (and) in demanding social justice. There was no policy of starving people. Nor was there any direction set out for carrying out mass killings. There was always close consideration of the people's well-being. Khieu Samphan, "Reflection on Cambodian History Up to the Era of Democratic Kampuchea"
In April 1998 one of history's most reviled mass murderers died. This was a leader who showed his people no mercy. As ruler of Cambodia Pol Pot was responsible for killing 2 million people. That's a quarter of the country's population. During his four year reign Pol Pot tortured and starved the Cambodians to death. Men, women, children and babies were often brutally clubbed to death with hammers and buried alive. As the architect of a brutal social experiment driven by racial and political hatred Pol Pot's regime left behind a tragic legacy of misery and mass graves. This page was last edited on 24 January 2019, at 04:27.